I am a great fan of Audrey Hepburn. She has always been a style icon and she has stolen the hearts of thousands of people (including mine) by her humble yet chic beauty. Talks and discussions around Audrey and her life remains an actual topic even today. 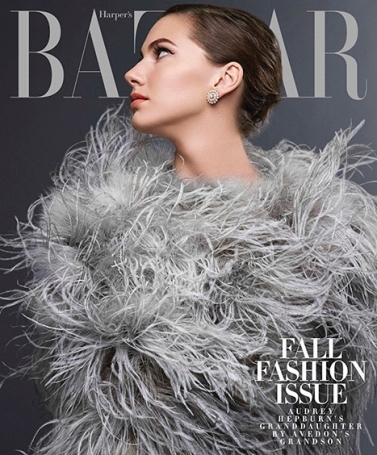 Recently, I came across an amazing article on the webpage of the popular Harper's Bazaar magazine, where Pamela Fiori tells the story of meeting and interviewing Audrey's granddaughter Emma Ferrer. The article was published along with a photo shoot of Emma, when she emerges in the pages of Harper's Bazaar for the first time. Interestingly, shoot was made by Richard Avedon's grandson, Michael Avedon. In the past Richard Avedon had captured Audrey in numerous of photos being highly inspired by her. So, the shoot turned to be a meeting between grandchildren of a screen legend and a photography legend. The article reflects an interesting view of what Audrey means for her granddaughter, how the famous actress is seen in the eyes of Emma. The answer is simply in the following two sentences stated by Emma "I couldn't really relate to Audrey Hepburn, the actress. To me, she was family". Unfortunately, Emma has never experienced the presence of her grandmother Audrey, the latter passed away of a rare form of cancer in 1993. So, Emma imagines Audrey according to her father's stories, old photos and movies of the timeless actress. The article is a stunning reflection of Emma's world and the world of Audrey seen by Emma. It's certainly worth to be read!